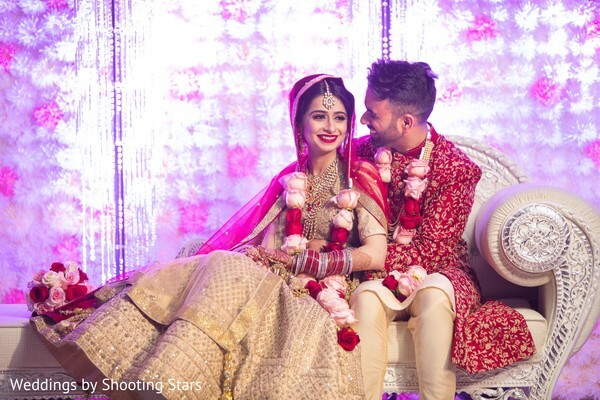 We couldn’t help but gathered all the best images of Purvika and Mohit’s post-ceremony moments! 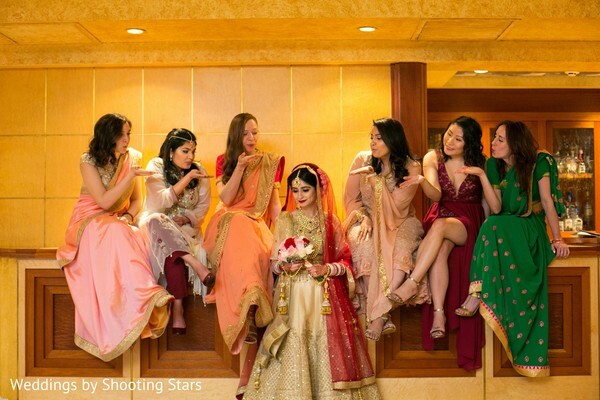 Immediately after the ceremony, the cute pair was masterfully portrayed by Weddings by Shooting Stars’ team after saying "I do"! The bride flaunted her romantic bridal bun with side roses, created especially for her special day by the professional MUA and Hairstylist Archana Chadha. 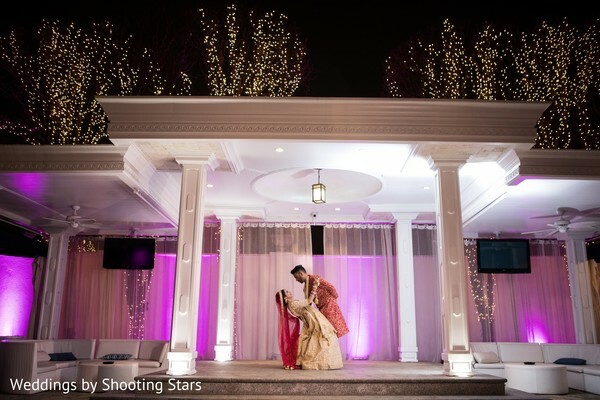 The reception venue was ready to receive the newlyweds in a Bollywood style white wedding sofa that accentuated the ballroom décor by Floral Explosion and that worked as a throne for the cute couple to share the best moments of their celebration! 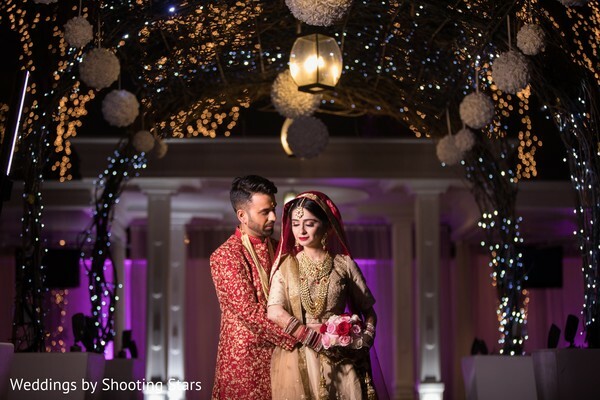 Among the great list of vendors, Benares Restaurant & Catering provided an exceptional dinner specially crafted to delight everyone at their big night at the splendid Chateau Briand and pop-out the cork of a champagne bottle to toast in homage to their love! 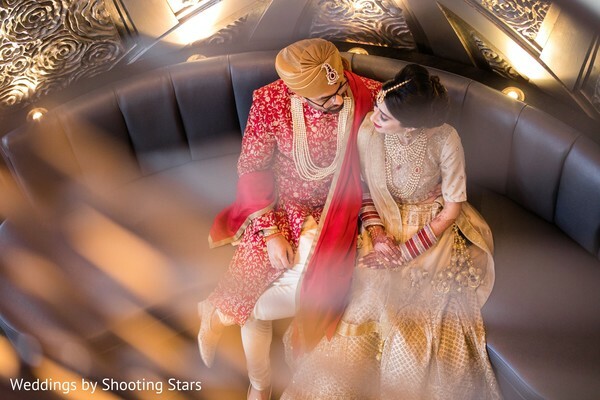 Don’t miss the incredible beautiful post-ceremony night images by Weddings by Shooting Stars in our full gallery! There are moments in life where rationale and complete understanding must take a backseat to passion and whole-heartedly just knowing that what (or who) is in front of you is the rest of your life. At that moment you just need to take it all in, take a deep breath and say to yourself: This is our story.. The story of Us. The first time I set eyes on Mohit's smile, when we met in PA, I knew two things: First, he seems like someone you can trust. Second, there was something about him that is disarming and endearing. People tend to say things without even meaning. With Mohit it was different, his actions spoke louder than words. He would not necessarily say things, but his actions showed all the time how much he cared and loved. His efforts toward our relationship were 10/10! Mohit and I knew fairly quickly that what we shared was the real thing. Thus began our journey! Him visiting me in NY. Me going to see him in VA. Every weekend, every day became about us. Together we saw highs and lows, but I knew we had a home. A home that was us. No matter what life puts us through, we always will be there for each other and be safe. Mohit has shown me what true partnership is. He is the man you can always count on to do the right thing in the best way. His loyalty and willingness to do for those he loves knows no boundaries and has no limits. He is the balance of strength and sensitivity. Mohit takes all that life has to offer, yet never takes it for granted. He makes me happy. Our love is one of communication, laughter, understanding, and adventure. Our story has just begun and we are so ready for our forever! I'm excited to continue this journey called life with you, knowing that I will always always and always have your love and support. Little did I know our Pre-Wedding shoot would turn into our Engagement shoot! I did not see it coming! Mohit and I planned to do our Pre-wedding shoot in DC. Mohit seemed anxious that day which was totally unlike him. At our last location for the shoot- Lincoln Memorial, Mohit took his phone out and said he needed to tell me something. He read to me what he had written and it would always be precious! He went down on his knee. I never thought I would be smiling and crying at the same time. It was such a beautiful moment! For the wedding, I wanted some light color and wanted to stay away from the traditional red and pink. But I was open to trying different styles and colors and figure out what looked good on me. I did my research and then tried a lot of lehengas until I wore that one lehenga and had butterflies. In that one outfit, I could picture myself as a bride. And I did not look any further. For my reception outfit, I did not look much. I saw only one outfit, fell in love, tried it on and that was it! I loved planning our wedding! It was overwhelming at times, but I loved being able to spend time on things I love. I enjoyed putting things together and making sure every element would work in harmony at the wedding. DIY projects were the most enjoyable part of the process! Seeing how everything turned out at our wedding made all the planning worth it! Our guests loved that our all events were different. We had different kinds of food- formal dinner at the wedding to street food style for Sangeet night. Everyone also loved that we had photobooth on one of the events, selfie station for the other and cameras on the table for another. I could not believe how magical the wedding day was! 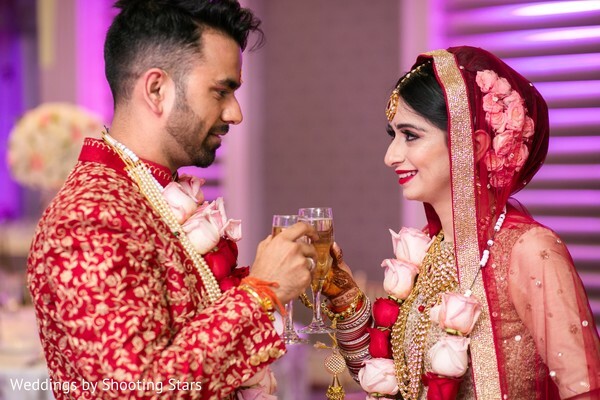 As I walked down the aisle and saw Mohit waiting for me at the Mandap, it all came together and I was blown away by how amazing everything looked. I cannot stop thinking about it. "Don't let your relationship dissolve into a battle over tablecloth colors or tuxedo styles. Keep things in perspective." I read this quote while planning my wedding and I think it helped me remember to prioritize. I put things that mattered a lot to me vs things I would not mind letting go/would not lose my sleep over. Wedding planning can be overwhelming, but make sure you guys get time for yourself and continue to work on your marriage than just the wedding. Hope this helps the Brides-To-Be. Find the perfect stock of wedding images to steal some inspiration for your wedding day tomorrow! 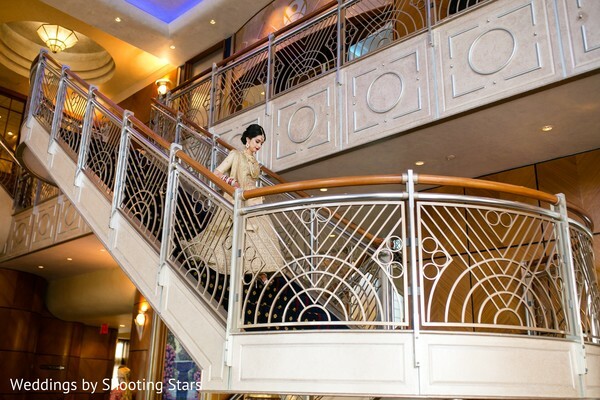 Styles By Swati - Salon SBS, Benares Restaurant & Catering, Chateau Briand, Francescos Bakery and Weddings by Shooting Stars are members of the Platinum Guide. Love what you see? Explore their portfolios.